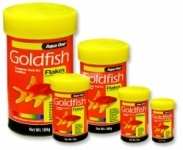 Aqua One Goldfish flakes are suitable for most cold water species including goldfish, shubunkins and small fancy goldfish. 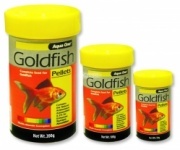 Aqua One Goldfish pellets are particularly suitable for larger goldfish, shubunkins and many fancy varieties. 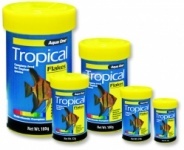 Aqua One tropical flake food is formulated for all tropical fish and supplies essential vitamins and minerals. Aqua One Cichlid pellets are an excellent staple diet for all larger carnivorous/omnivorous cichlid species. 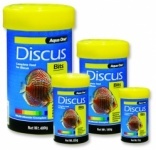 Aqua One Discus bits are intended to be mixed in with the daily feeding of fresh or frozen foods.